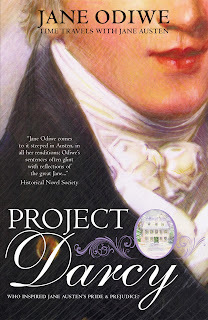 I am so excited to be a part of the Blog Tour for Jane Odiwe's new book Project Darcy. Not only do I enjoy the books that I have read by Jane Odiwe, but I adore her art! It is so beautiful and in this post she talks of her new book and her art. She even shares some of her paintings with us. Aren't we the lucky ones! I have always been fascinated with both time travel and archaeology. To mix them with Jane Austen is a treat, indeed. Thanks for sharing with me and my readers, Ms. Odiwe, and for allowing a giveaway too. 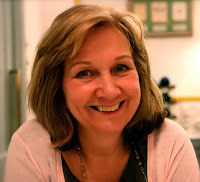 Thank you so much, Janet, for inviting me to your blog today to talk about my new book, Project Darcy. As a fellow artist, I know how much work goes into creating one of your fabulous pictures, and I thought I’d talk about one of the paintings I did that inspired my novel. 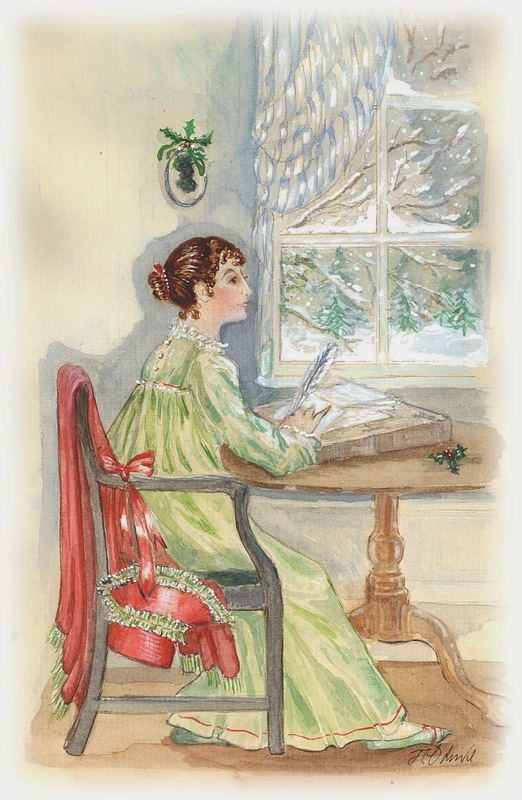 This is a book I’ve wanted to write for a long time, the story of Jane Austen’s exciting Christmas of 1795/96, when she fell in love with Tom Lefroy. I enjoyed writing a time travel novel so much with my last book that I wanted to do the same again. Ellie is a modern heroine (a little like Elizabeth Bennet) who travels back to the past to witness not only what happens to Jane, but experiences her every thought and feeling! About thirteen years ago, I started making paintings of Jane Austen and depicting scenes from her life. I was fascinated by this young Jane, and how she looked. Every contemporary account said she was tall, slim and attractive - she had hazel eyes, rather rosy cheeks and curly brown hair. I used Cassandra’s portrait of her to make my own and took off her cap, as she wouldn’t have worn one in her youth. More than anything, I wanted to see her dancing with Tom Lefroy and I decided to paint them at Ashe Rectory with Tom’s aunt, Madame Lefroy, and all their neighbours. I used reference material - there are portrait miniatures of Madame Lefroy and her nephew Tom, and I used these to make my own sketches. I wanted to show everyone dancing on a starry night, and to get as much movement in the dancers around them so the focal point would be on Jane and Tom. I wanted to see Jane dressed up and wearing a ball gown, and Tom in evening clothes. At the sound of his voice, I wanted to prolong the moment of turning – as soon as I did I knew the evening would start and it would all be over in the time a breeze ruffled the lake beyond the formal gardens, stippling the surface into beaten silver. Every second felt like an eternity as I revolved. At last, it was time to stare and take a memory picture in my mind. Fair hair shining in candlelight, a golden curl falling on an eyebrow, brooding grey eyes contemplating me with a steady scrutiny, broad shoulders, black coat, white cravat, silk waistcoat, satin breeches, gleaming shoes – a promising list, but the whole married into an epicurean feast for the senses – my senses. He bowed, and I curtseyed. I’ve had a wonderful time writing this book, and imagining all the scenes - thank you again for giving me the opportunity to tell your readers about Project Darcy. It is high summer when Ellie Bentley joins an archaeological dig at Jane Austen’s childhood home. She’s always had a talent for ‘seeing’ into the past and is not easily disturbed by her encounters with Mr Darcy’s ghost at the house where she’s staying. When Ellie travels into the past she discovers exactly what happened whilst Jane danced her way through the snowy winter of 1796 with her dashing Irish friend. As Steventon Rectory and all its characters come to life, Ellie discovers the true love story lost in Pride and Prejudice – a tale which has its own consequences for her future destiny, changing her life beyond imagination. These paintings that you shared with us today are absolutely gorgeous. I love the Ashe Ball painting. I think you most definitely achieved your goal. From the pictures that I have seen, you certainly captured the look of Jane Austen and Tom Lefroy. Thank you so much for allowing me to show your work here at More Agreeably Engaged. Thank you also for telling us about your new book, Project Darcy, and a little of how it came to be. I look forward with much anticipation, to reading it. For the giveaway of her book, Project Darcy, Jane Odiwe is generously offering a paperback of her new book to one lucky winner and the giveaway is open internationally. To be entered leave a comment below as I always love reading your 'say in the conversation'! Good luck to all. Be sure to include your email address in the comment. To prevent unwanted spam, put your email address with an (at) instead of @. Winner will be chosen in a random drawing. Giveaway ends at midnight, November 13. The book sounds intruiging, as a fan of Miss Austen I often wished being able to catch a glimpse of her and her life. Looking at your artwork Jane, that feels suddenly closer. Jane has a very engaging style, I can hardly wait to read Project Darcy :). It is wonderful, other opportunity to win this book, so I have the highest curiosity and look forward to reading it. What technique have you used to paint the main picture of your cover? Your paintings are wonderful. Your idea for this story has combined my love for Jane Austen and archaeology. I can't wait to read this one. Jo's Daughter, thank you for your kind comments about my book and artwork. Petronela, thank you-I hope you enjoy it if you get a chance to read it. Warmisunqu Austen - I used watercolour for this painting-thank you for your interest! summerrivers - Thank you, summer rivers - I hope you enjoy Project Darcy! Thank you, Vesper-that's very kind of you! Thank you, Kelli-you are so kind! Thank you for stopping by to leave your lovely comments! Jane is absolutely amazing! She is great & I'm proud to have her a friend, mentor & one of my fave modern authors. God bless her & may she continue to bless us with her innate talent. Searching for Captain Wentworth is my favorite & I'm looking fwd reading Project Darcy. Thank you for yet another lovely story, Jane! The premise is delightful, and your choice to write about that particular time in Jane Austen's life makes for a wonderful read! I have the ebook - but who can resist the temptation of a paperback with your art on the cover :) ? You have the loveliest colors and style! I always get the feeling that your Jane is happy and enjoying herself, and that she is loved by those around her. I think that is a fantastic skill that you can put into a picture what your imagination sees in a written description. I try to imagine what Jane's life was like to give her what she needed to write her novels. 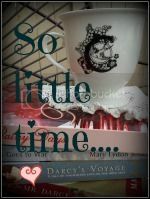 Thanks for sharing and I look forward to reading your latest time travel to Jane Austen's past. I am a huge fan of your artwork, Jane, as I am of Janet's! I am in awe of those who can bring such vividness and life to drawings. 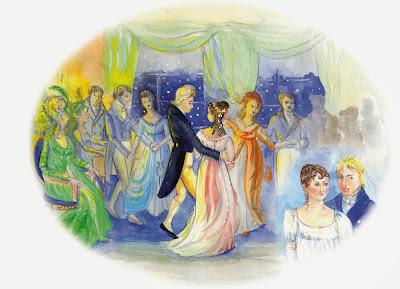 I do love the dancing scene, especially the way Jane and Tom stand out against the shadowy others in the room and the lovely starry sky visible through the windows. Really enjoyed reading about the background to how and why you drew this picture! Wishing you continued success with the latest new release! Thank you, Cassandra. I am a huge fan of your books! I also love Jane's books and artwork. She does beautiful images. Adalgisa-it's music to my ears when a reader says how much they've enjoyed one of my books - thank you for your wonderful support! Jane Austen is very good at bringing people together and making them friends, as she did with you and me! Joana, thank you for all your generosity and lovely comments, and for visiting me here-your support means so much! June, I really think Jane must have been happy at this point in her life with her family and friends around her at Steventon, and, of course, handsome Mr Lefroy! Sophia Rose, thank you for following me on my blog tour-lovely to see that iconic image of Jane popping up again, and thank you for your very kind comments. Janet's work is wonderful, isn't it? Thank you, Cassandra-you're always so kind and lovely about my work, whether written or painterly! How wonderful to fulfill two passions: creating your own visuals and writing about your favorite topic! The story of Project Darcy sounds wonderful, and the stunning artwork only contributes to it. Thank you for the giveaway! Those pictures are lovely! I particularly like the one of Jane at her desk. I love the paintings. I've enjoyed Jane Owide's other books. I look forward to reading another and pictures too!! Eva, I am very lucky to have two passions-sometimes it's hard to choose which to do next. Thank you for your very kind words. Ceri, thank you - that's my painting of Jane writing 'First Impressions' as she looks out onto the snowy Hampshire countryside. Catherine, that's so lovely of you, and music to my ears! Thank you for commenting! I admire your artwork, Jane. It's so beautiful and you have definitely brought Jane Austen and her family and friends to life. I would absolutely love to read your new book and own your artwork print. 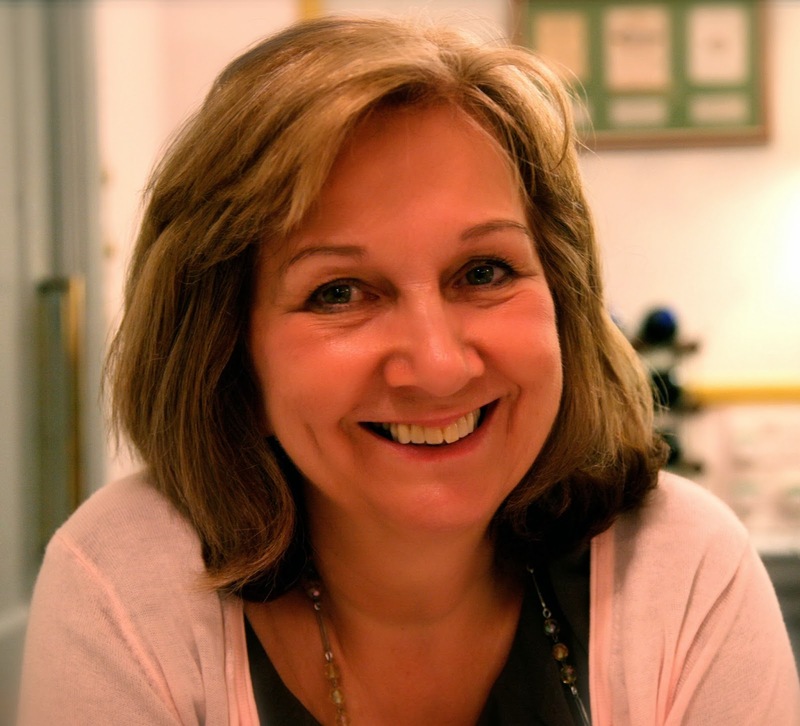 Jane, I've been trying to catch up with your blog tour! Thank you for the chance to win the paperback copy of the book. Like Joana Starnes has mentioned, your illustrations make this giveaway an even greater opportunity (I particularly like the front cover!). Luthien84 and Lena L - thank you so much for stopping by to leave such lovely comments-they are greatly appreciated!